I’m not big on fast food. But after a long day, the last thing I want to do is slave away in the kitchen. This is why I love Chinese cooking. The availability of ingredients, the ease of its cooking techniques and the almost instant (and always flavorful) gratification make sitting down to simple Chinese stir-fry such a delight. The cuisine of choice? Sichuan, care of my current cooking guru, Fuchsia Dunlop. The dish? A simple stir-fry of spicy chili paste, salty fermented black beans, fragrant green onions and lucious slices of pork belly. I’m actually drooling just writing about it. In a seasoned wok, heat the peanut oil on high. Once the oil is slightly smoking, add the pork and stir-fry for three to four minutes or until the oil clears and the pork has turned color. While the pork is cooking, add the salt. 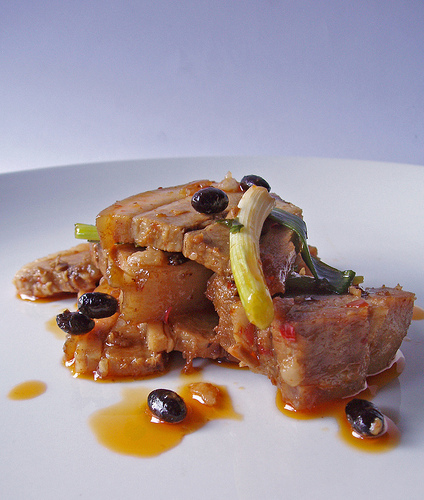 Once cooked, push the slices of pork to one side of the wok and add the chili paste and fermented black beans. Stir-fry the chili paste mixture until the oil turns a fragrant, glossy red. Add in the pork slices and then the soy sauce and sugar. Mix in the green onions and continue to stir-fry until they are almost cooked through. Plate and serve immediately. Serves three as a main dish. According to Ms. Dunlop, “Salt-fried pork is just the kind of dish you might find on a family dinner table in Sichuan with a few stir-fried vegetables, a simple soup and plenty of rice.” Fast food need not come in a styrofoam container. With the right ingredients, a little elbow grease and a bit of patience, you can have a mouthwatering meal at home. One more thing. Make sure to have more than a few bowls of steamed rice on hand. Trust me. You are going to need them. Just bought a copy of Land of Plenty. Thanks for the recommendation. Btw, love the photo. Hi ragamuffin girl. Haha. I know how that feels. Looking forward to read about that food trip soon. Adam's Seriously Good Ice Cream. Seriously.